Fill a wooden barrel with water and poor that water into an airplane. Continue doing that until the amount of water reaches its maximum value - 999. Keep adding more water and notice that its amount inside of the plane stays the same, but the water disappears from your inventory. This is not happening on git master, the barrels are not emptied and are being stacked as intended? Was the report for an old version? I can reproduce this. @Maikel: Did you try not putting the barrel into the plane, but just the liquid itself? The display is just wrong in this case. But it is not good to put liquids in the airplane in the first place. Same happens with the lorry. I think the liquid system is not correct here. Marky? I just noticed that this bug was assigned to me, sorry for the delay. 1) it seems wrong that you can put water into the airplane. What do others think about that? 3) the rest could be either the liquid system or the display, or both. Most likely the plane gets the additional liquid, but just displays it as 999. 1) seems clear: the plane offers the liquid spray option, so that is intended - but the description also says that the liquid is sprayed from barrels, so it should not be possible to put liquids into the plane directly. 3) the main explanation: the display simply stops at "999x", but if you hover the icon, then you can see the actual amount in the description field, e.g. 2000x water. It should be ok if we add another digit to the display. Regarding 3): Both of those displays are sometimes broken, see the two attached screenshots. In the first (115), the upper display actually shows four digits (1351), but the one in the description field shows 300/300. The second one (116) shows the "airplane" situation where the upper display stopped at 999 and the lower one shows the correct count. That is even more strange. I think the 300/300 is a not updated hover thingy (because a barrel was transferred). For now I cannot explain why it is displays more than 999x sometimes. Quick fix: I'll disable the plane from collecting water - but this problem will otherwise still exist in the lorry and foundry. 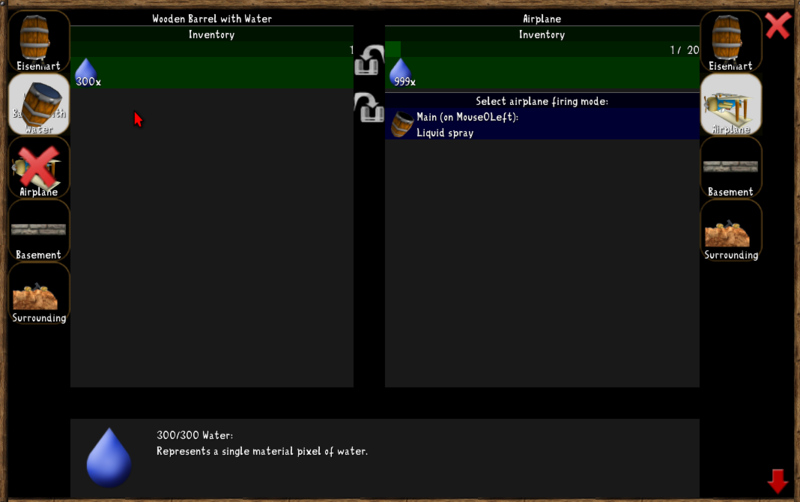 When I designed the liquid spray option, I wasn't aware that all containers can hold liquids. So I never bothered to do anything about limiting any liquid intake because this is unexpected. So, yeah, I would not have all IsContainer() objects also intake liquids and limit it to IsLiquidContainer(). This is how I understood that callback. Removing liquid collection from the lorry is a side effect, but it is not bad. The lorry behavior was weird anyway, because you could for example put lava and wood in it, without the wood burning etc.